Start them young and you've a cyclist for life! e-bikes, battery powered, green and clean – we loved this idea when we heard about it; a story of one young woman’s idea to build an ‘insider business’ founded on her sixth sense for Malta’s appeal to outsiders. It’s innovative, niche and going places – literally. There’s an offer to take advantage of too – read to the end. “If you grow up in the Netherlands, cycling is an extension of you; it’s like an umbilical cord. You take kids to school on bikes, you go shopping cycling. It’s just natural to do,” says Lysanne Kerr, a Dutch national and the inspiration behind a start-up offering Island tours by electric bike, MaltAcross. Cycling has taken off big time in Malta in the past decade, and there are several clubs dedicated to the sport. Before then, most cyclists would have been elderly men, farming folk mostly, wobbling along on rickety boneshakers from small-holding plot back home. As a long-time foreign resident here (she moved to Malta with her parents while still a student) and now married to a Maltese, Lysanne is the epitome’ of an insider-outsider. “I’ve even shown locals some parts of the islands they didn’t know about,” she adds. The tours are in fact ideal for local residents, not solely tourists. We can see them easily as gifts for birthdays or as a more active, off-beat activity for friends at weekends. As she was forming the idea into a business, Lysanne realised too that holiday-making cyclists would be of differing fitness levels and that Malta would be challenging terrain – steeps hills would be unavoidable whichever route she took. But hills also offer stunning scenery! So, she opted for e-bikes powered by a rechargeable battery of 36 volts. “If you need the extra boost, you can use the power which allow you a top speed of 25km/hr. Otherwise, if you’re fitter, you can flick the switch off. This means everyone keeps up and groups can really enjoy the experience without individuals getting too tired – unless they want the challenge!,” Lysanne explains. The handlebars are upright, which makes this an ideal bike for sightseeing. Cycling on an e-bike is just like cycling on a normal bicycle; you still need to pedal as usual, and the bike has seven gears for comfort. “We start in Gharghur, an amazing high vantage point, and plan routes that head out well away from commercial and urban centres sticking to small lanes in open countryside and diving off down alleys and narrow streets of villages. Tours are mostly half day (4 hours) but full day and tailored times can be arranged. “The beauty of the cycling pace is that you chance upon views and small hidden gems that you just wouldn’t reach by public transport as a tourist even if you knew about them, or a local for that matter. Sometimes, a sight is as simple as a stunning view that you turn a corner and see unfold before you. Other times, we pass specific historical places of interest such as prehistoric sites. Since groups are small – max four, minimum two – and with myself as tour leader, we can tailor the route to suit a group’s pace and particular interests. For example, some people are keen to stop at traditional food outlets, others at crafts workshops, ” Lysanne says. Gozo tours are in the pipeline too. MaltAcross starts all tours with full instructions on the bike and a safety briefing including highway code points, and participants wear helmets. Bikes are for adults and adolescents but families with young children up to 15 kilo can use front baby seats. Lysanne’s venture started just this past summer, in July when her MTA licence came through, but already she’s had a good number of groups and gleaned positive feedback. Her most unusual and telling testimonial came from a person who had a puncture. “It’s when something goes wrong that you learn the most about your business,” says Lysanne. MaltAcross Special Offer – grab a friend and get cycling! 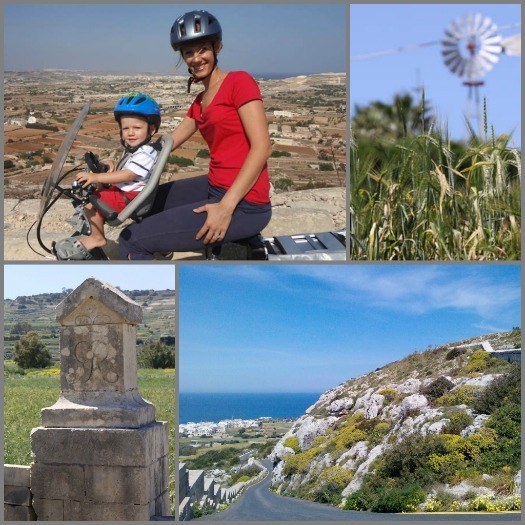 Lysanne is offering a special discount to Malta Insideout site users of either 10% off the tour price of Eur 55 per persons or free pick and drop back from / to your residence, hotel or home. The offer runs for two months till end November and is for one-time use only per person. Bookings can be made for groups of a minimum of two and a maximum of four people on the same tour. Previous Post Do Expats learn Maltese? Wonderful to have your endorsement of Lysanne’s MaltAcross; I am pleased all went well. Her business deserves our support for being something truly different on offer here to both visitors and locals. Dear MaltAcross, We had such a perfect morning! The sun was shining, the cycles were super, the guide was lovely and the environment was so beautiful!! An absolut must to discover Malta and definitely worth repeating!